Versailles junior Cael Bey goes for a takedown during at 152-pound match at the Division III state dual team championships on Sunday at St. John Arena. 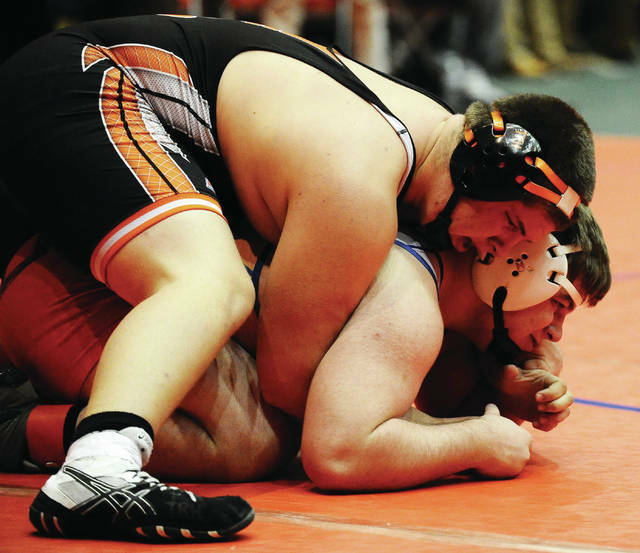 Versailles 285-pounder Austin Nerderman won a 4-0 decision in the semifinals at the Division III state dual team championships on Sunday at St. John Arena. 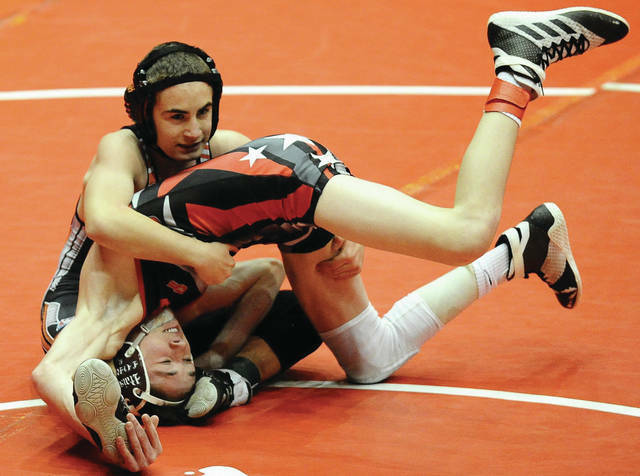 Versailles freshman Carson Bey won his 132-pound match in the quarterfinals at the Division III state dual team championships on Sunday at St. John Arena. 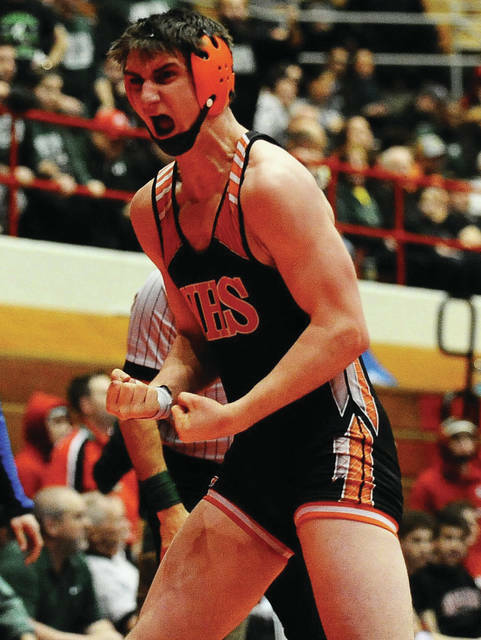 Versailles senior Derek Cavin celebrates his pin at 182 pounds in the semifinals at the Division III state dual team championships on Sunday at St. John Arena. 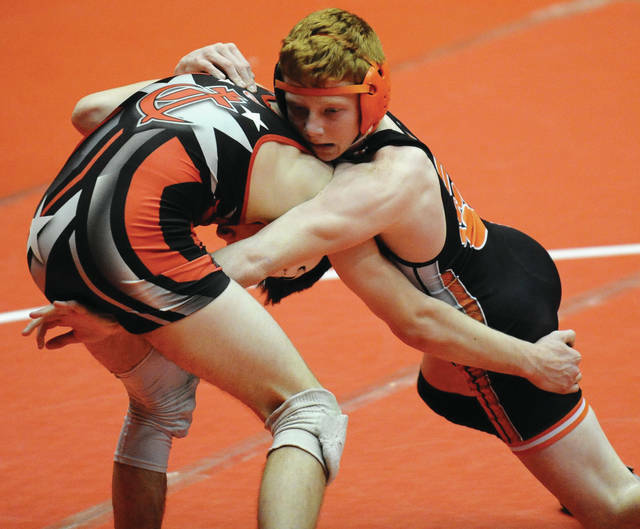 Versailles senior Jacob Poling won his 126-pound quarterfinal match by pin at the Division III state dual team championships on Sunday at St. John Arena. Versailles freshman Mike Reed goes for a pin in the 106-pound match during the quarterfinals at the Division III state dual team championships on Sunday at St. John Arena. Versailles junior Nick Monnier gets control of his opponent during his 138-pound quarterfinal match at the Division III state dual team championships on Sunday at St. John Arena. COLUMBUS — The Versailles High School wrestling team wanted to stick around Columbus a little longer Sunday. But when some of the Tigers return in March, the experience gained Sunday could lead to a longer visit. 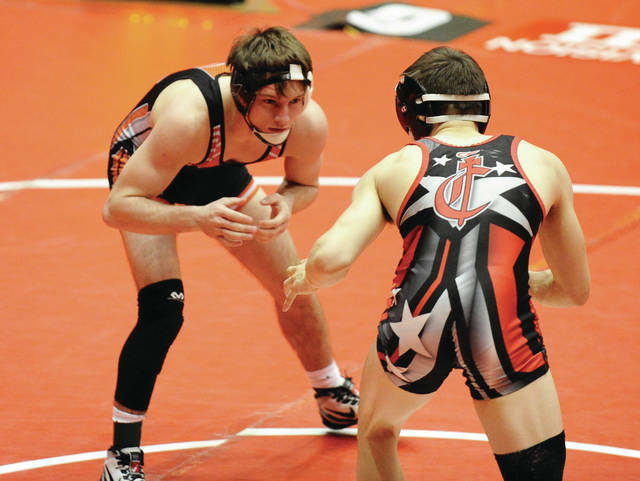 Third-seeded Versailles, making its fourth appearance at the Division III state dual team championships, made a run at No. 2 Milan Edison before falling 45-23 in the semifinals. The Tigers have reached the semis in three of their four trips to St. John Arena. 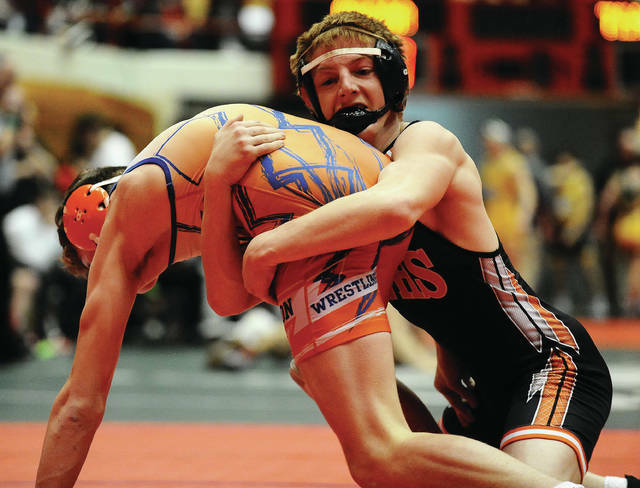 Wrestling against some of the state’s top competitors in a high-energy atmosphere can provide a boost for the Tigers in their bid for the individual state tournament in March. Versailles knocked off No. 6 Mantua Crestwood 40-29 in the quarterfinals. Crestwood won five of the first seven matches for a 24-10 lead. The Tigers received wins from senior Jacob Poling at 126 (pin in 5:35), freshman Carson Bey at 132 (9-1 major decision) and junior Cael Bey at 152 (pin in :53) to pull within 24-16. 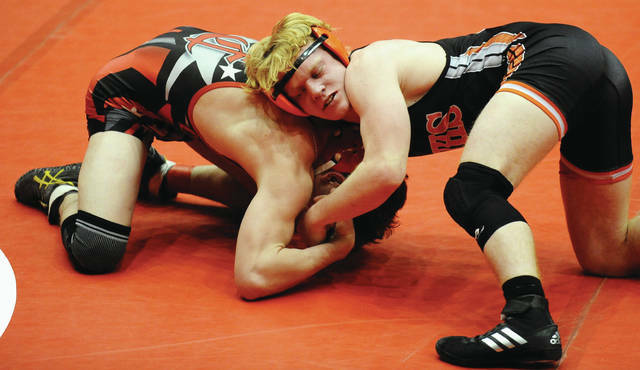 After a Crestwood win at 160, Versailles claimed the final five matches. Senior Derek Cavin won a 12-5 decision at 182 and freshman Brayden Keihl scored a 6-5 decision at 220. Senior Tyler Gigandet (170), junior Isaac Grilliot (195) and sophomore Austin Nerderman (285) won by forfeit. In the semifinals, Versailles trailed 21-0 before Carson Bey ended the run with a 6-0 decision at 132. Junior Nick Monnier followed with a 15-5 major decision at 138. Edison won at 145 and 152 for the 33-7 lead before Versailles rallied. Cael Bey scored a 3-1 decision at 160, Gigandet won a 17-3 decision at 170 and Cavin won by pin in 5:32 at 182 to get the Tigers within 33-20 with three matches left. Edison claimed the match with pins at 195 and 220 before Nerderman won the Tigers’ final match at 285. “I think we got too far behind early on,” coach Bey said. “Isaac has been pretty tough for us all year. He just got caught in a move (in the 195-pound match). I’d like to have seen that match go three periods and see what happened in the third.